Howland fire and EMS chief Josh McNally (left) and town manager David Wilson beefed up the town's fire and emergency services, which now contribute $700,000 in revenue. Wilson also cut health insurance costs for town employees and other items so that next year's proposed town budget is 48 percent less than the previous year's. If approved by voters, it could mean a reduction in the town's mill rate. It’s the time of year for towns across the state to tally their annual budgets and for residents to eye potential property tax hikes. However, one Penobscot County town with 1,250 residents has managed to add services while cutting its budget by almost half, not including school costs. Residents of Howland, about 30 miles north of Bangor, will vote on the town and school budgets at a June 12 town meeting. And if the budgets are approved, they’re likely to see property taxes decrease, said David Wilson, who became town manager in August 2016. “I think we’ll safely put it down 2 mills,” Wilson said. Howland’s current mill rate — the amount per $1,000 of a property’s assessed value — is $23.19. That compares to $21.93 in Bangor in 2017. In the 2017-2018 fiscal year Howland will show a $288,526, or 48 percent, reduction in the town’s portion of the overall budget compared to the previous year. In 2016-2017, the town also saw a savings of $68,000 over the previous year. The extra money is a turning point for Howland, according to Wilson, who said that prior to 2016 the town’s budget increased each year, as did the property tax rate. Many Maine residents wait for their yearly property tax bill and expect an increase, he said, adding the amount the town is saving is unusually high. He credits the budget committee, selectboard and the new fire and EMS chief, Josh McNally, for digging up the savings and boosting revenue for the town’s emergency management system service. The fire and EMS departments were combined into one department in late 2016. McNally, a former firefighter and paramedic in Orono, had been working part-time, but became full-time this February. “We saw a need for an emergency service in our area,” said Howland selectboard chair Michael Harris. The town moved from an on-call fire and EMS service to round-the-clock fire and paramedic coverage. It expects to hire several full-time staff this coming year. Over the past year it added a third ambulance for non-emergencency call transport, and that boosted income to $700,000, more than double the goal of $300,000 in the fiscal year from July 2017 to July 2018. “It was so successful. We exceeded our revenue goal by the end of the first year,” said Wilson. “If we keep our current [EMS] contracts, we’ll bring in over $1 million next year.” To be conservative, his budget goal is about half that amount at $527,755. The money will offset the cost to run the fire/EMS department. The fire department serves 3,500 people in abutting communities and EMS has contracts throughout Maine, for example, Emilio Estates, an assisted living facility in Corinth. There also are agreements with St. Joseph’s Hospital in Bangor and Penobscot Valley Hospital in Lincoln. The third ambulance, for non-emergency transportation, also travels to northern Maine, Maine Medical Center, Boston, Connecticut and New Hampshire. “It sounds like the town is doing something right, with savings going up for two years,” said Eric Conrad, spokesman for the Maine Municipal Association. He said he doesn’t know how many of Maine’s 490 municipalities have been able to cut their budgets. But he said Maine towns are weathering the ups and downs of the economy better than five years ago. “They are trying something new and it works,” he said of Howland’s expansion of EMS service. 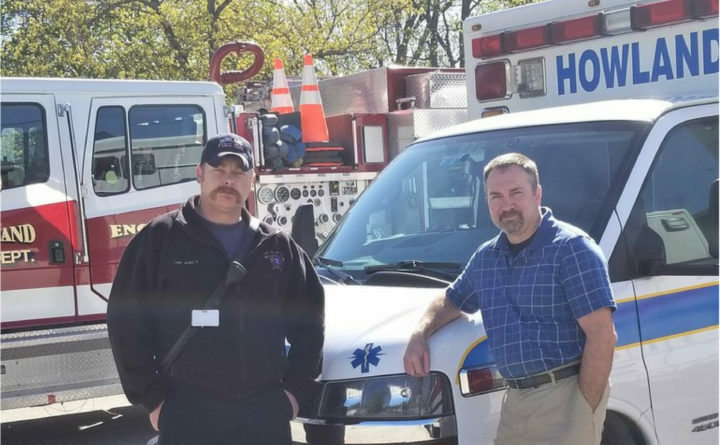 Jeff Cammack, executive director of the Maine Fire Chiefs’ Association, said other Maine towns, including Caribou and Presque Isle, also have expanded their EMS services to pay for their own emergency needs. Budget savings came from Wilson and the budget committee shaving costs such as health insurance for employees. By switching plans, they saved $50,000 for the seven full-time employees. Another $20,000 reduction came from cuts in the fire suppression fee by working with the Maine Rural Water Association. Savings also came from moving the transfer station out of the center of town and turning it into a recycling station rather than a recycling center with a separate building. Recycling had become cost prohibitive because the town doesn’t use single-stream recycling. Having residents sort their own recyclables at a station saves money over having an outside company do it. He also wants voters to approve a tax incremental financing, or TIF, district at the site of the former tannery that shut down in 1971. A TIF is a flexible financing tool used to leverage new property taxes. The new taxes can be used to finance local public or private projects for a defined period up to 30 years. Hundreds of Maine communities have TIF districts. Wilson also said a new business has proposed building on the old tannery property. Mike Brasslett, owner of Quality Saw & Supply in the neighboring town of West Enfield, said he has made an offer in writing to the town to buy the tannery property and the former recycling plant. However, he said the potential TIF was not part of his decision. The economic development committee has approved his offer, but it still must be approved by voters on June 12 because the town owns the property. “I love the location. It’s where the Piscataquis and Penobscot Rivers meet and the Atlantic salmon fishway is there,” said Brasslett. He said the proposed buildings on the site are not set yet, but he gave five possible options to the economic development committee: a restaurant, a pool hall, an outside music venue, an inside music venue and a catering operation. In the future, he said he might consider adding some rooms for tourists. “I want to generate cash flow, jobs and tourism,” he said. “That will be the first tax money on the [former tannery] property since 1971,” Wilson said. The town, he said, has a stable elderly population, with few young people. “If I can bring down the mill rate, why wouldn’t business come here?” Wilson said.